Part I of an in-depth analysis of Petyr Baelish’s modus operandi and planning. By the time we reach the Alayne gift chapter from The Winds of Winter, we have a long history of Littlefinger’s scheming. Looking at patterns in his behavior, plots, and modus operandi might offer clues as to his future plans. Petyr’s first scheme dates back to his time at Riverrun when the arrival of the feuding lords Bracken and Blackwood allowed young Baelish and the Tully children to get good and truly drunk. The scheme is rather adolescent and hardly original, applying alcohol to separate a young woman from her smallclothes when more sober machinations have failed, but it still serves to illustrate the elements of his future plotting. It was an opportunistic scheme born of chaos and specifically the chaos of two feuding factions that occupied the attention of the responsible authority figure, allowing his charges to misbehave right under his nose. Cat was already betrothed to Brandon Stark, and our young Petyr sought to appeal to vice in order to overcome the Tully motto and three pillars of Westerosi loyalty, Family, Duty, Honor, to make Cat his. Petyr “Life is not a Song” Baelish danced with Cat six times because Lord Bracken had brought his singer to Riverrun. We can see both his disillusionment with song given his failure with Cat and his view of song as a tool, which he’ll later employ with Olenna while initially plotting the Purple Wedding. Perhaps most telling is the fact that it was Lysa that seduced him rather than Petyr seducing Cat, which may well be a clue regarding his ultimate demise. In the aftermath of his failure to seduce Cat, he eventually appeals to martial skill to try and make Cat his by dueling with Brandon. The duel is a pathetic failure, and seems to have left him with both a personal disdain for martial skill as well as a general disdain for the pillars of Westerosi loyalty that allow one to command others with martial skill. His desire for revenge against Brandon is carried out by Aerys in a reinforcement of the lesson of two factions in conflict providing opportunity. Littlefinger’s life is saved by Cat’s notions of Family, Brandon’s notions of Honor, and his general appearance of being harmless as he was only a boy—all lessons Petyr Baelish takes to heart and seeks to exploit going forward. The duel also indirectly offered him insight into the politics and posturing of the great lords and their families. Littlefinger was expelled from Riverrun for having gotten Lysa pregnant, but both Hoster Tully and Jon Arryn were content to cover it up and let outsiders believe the duel was the cause. Even the greatest of lords would put aside honor and marry a soiled bride for the practicalities of a fertile wife to produce an heir and the exigencies of war. Honor and duty become more malleable under pressure. Petyr seems to have come to view this keeping up appearances as a form of hypocrisy designed to hide that nobles are just as buyable as everyone else. The whole drama did give him an insider’s view into how high lords conceal and cope with scandal, and how such family drama can often leave a House vulnerable through an unhappy slighted sibling. My father said he was too lowborn, but I knew how high he’d rise. Jon gave him the customs for Gulltown to please me, but when he increased the incomes tenfold my lord husband saw how clever he was and gave him other appointments, even brought him to King’s Landing to be master of coin. It was me who got you your first post, who made Jon bring you to court so we could be close to one another. You promised me you would never forget that. So the financial genius of Petyr Baelish is at least in part an illusion born of his aborted child with Lysa. Jon Arryn took no notice of Littlefinger’s performance in Gulltown to merit a move to King’s Landing. Littlefinger’s success in Gulltown was a cover story, just like his exile over the duel for Cat, to rationalize a change in post designed to appease Jon Arryn’s young unhappy wife. 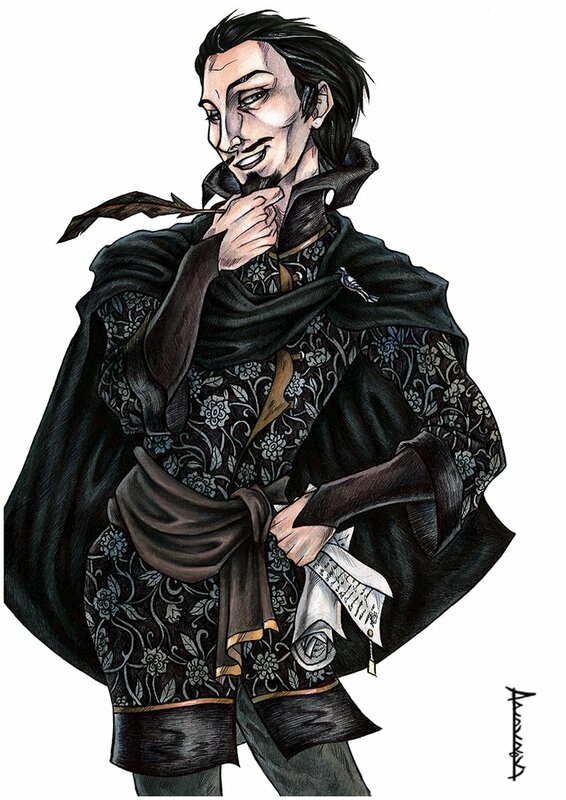 Petyr’s financial successes also seem to be far more the result of corruption than genius. The corruption was not perfectly hidden either, as Stannis seemed well aware of it. Littlefinger had a nose for gold, and I’m certain he arranged matters so the crown profited as much from your corruption as you did yourself. The crown pays wages for twenty turnkeys, my lord, a full score, but during my time we have never had more than twelve. We are supposed to have six undergaolers as well, two on each level, but there are only the three. In the dungeons of the Red Keep alone, just under 50% of the wages are fictitious. If the rest of the crown’s expenses are like either the dungeon payroll or Slynt’s wage scam, it is easy to imagine how Baelish conjured his magical money reputation. He’s basically been stealing from the crown through fabricated expenses and his magical revenues are simply from cutting the treasury in on a percentage of his own graft. Again, we see Petyr utilizing vices, in this case Slynt’s greed, to make someone abandon duty to become Littlefinger’s. Baelish also exploited the conflict between Stannis and Robert to perpetuate his scam. The Baratheon conflict blends in elements of exploiting sibling rivalry and vices on Robert’s part as well, but they are all elements present in Petyr’s first naïve little scheme and its consequences. What is worth noting is that his hands were not clean. Jon Arryn knew and had evidence that he showed Stannis. Littlefinger was likely confident in his ability to whisper in Robert’s ear, the animosity between Stannis and Robert, and the protection Lysa provided him from any potential wrath from Jon Arryn. That would fit with his pattern of arrogance toward Tyrion later. Still, Stannis lived to tell the tale to a room full of people at the Wall, so Jon and Sam know and that information could easily be passed to Tycho and then on to the Iron Bank in Braavos or to anyone at the Citadel by Sam. These may not be dire threats or imminent ones at this stage, but they are definitely not the signs of someone with perfectly clean hands. This pattern will continue throughout Littlefinger’s story. Aside from the wage fraud, Baelish also seems to be engaged in large scale embezzlement and price-fixing schemes. The scope of these activities is enormous, and does far more to explain where he gets the money to buy off the Vale lords than his creating false expenses for the crown. Through Tyrion, we get an idea of the scale of these financial manipulations. (…) today the crown’s revenues were ten times what they had been under his beleaguered predecessor… though the crown’s debts had grown vast as well. A master juggler, was Petyr Baelish. Unless a new source of coin could be found, or the Iron Bank persuaded to relent, he would have no choice but to pay the crown’s debts with Lannister gold. He dare not resort to new taxes, not with the Seven Kingdoms crawling with rebellion. Half the lords in the realm could not tell taxation from tyranny, and would bolt to the nearest usurper in a heartbeat if it would save them a clipped copper. There is no way Petyr would be thought of as “everyone’s friend” had he raised taxes, even if it were Arryn or Robert’s doing. Taxes are also a rather mundane means of increasing revenue, and hardly the type of solution to earn someone the reputation of a miraculous gold dragon breeder. “The Crown is more than six million gold pieces in debt, Lord Stark. The Lannisters are the biggest part of it, but we have also borrowed from Lord Tyrell, the Iron Bank of Braavos, and several Tyroshi trading cartels. Of late I’ve had to turn to the Faith. The High Septon haggles worse than a Dornish fishmonger. The math simply does not add up. Six million in debt would cover four tourneys as grand as the Hand’s Tourney each year for Robert’s entire fifteen year reign. The vast majority of the Hand’s Tourney expense is the prize money totaling 90,000 gold dragons. The “prodigious feast… cooks, carpenters, serving girls, singers, jugglers, fools,” and other expenses are only 10,000 gold dragons. Without the prize money, Robert could have hosted a tourney like the Hand’s every fortnight for his entire fifteen year reign and still not accumulated six million in debt. That is without even considering our gold dragon rubbing prestidigitator’s supposed tenfold revenue increase. The admittedly irresponsible Robert Baratheon would first have to spend nine times more than Aerys’s annual budget before needing to borrow anything if Littlefinger’s financial gains were genuine. Since they seem to be a work of fiction, one must read between the lines to find the real story. When Tyrion takes over as Master of Coin and begins combing through Littlefinger’s ledgers, he describes them as a labyrinth. When he tries to discover how Baelish created money, the investments smell worse than week-old fish. Tyrion is a gold-obsessed Lannister whose training, intellect and bookish nature make him better suited to navigate ledgers and accounts than almost anyone in Westeros. If the ledgers are a migraine-inducing maze and the ventures are more rotten than Hamlet’s Denmark, the answer is simple. Littlefinger was not breeding dragons but embezzling them, and his ledgers are merely a tale left for his successor to chase. He paid the king’s debts in promises, and put the king’s gold to work. He bought wagons, shops, ships, houses. He bought grain when it was plentiful and sold bread when it was scarce. He bought wool from the north and linen from the south and lace from Lys, stored it, moved it, dyed it, sold it. The golden dragons bred and multiplied, and Littlefinger lent them out and brought them home with hatchlings. Littlefinger basically bought the prerequisite assets to start monopolizing trade and is using the crown’s capital to do it. Shops to buy the goods at port, ports he largely controlled through his subordinates as Master of Coin, the same shops to sell those goods to the public, ships and wagons to transport those goods to other markets, and houses to store those goods to help control the available supply. The fact that he’s buying from the north, south and Essos tells us how expansive his operation has grown. We also see he’s engaged in manufacturing raw goods into finished products to the extent that it existed in this pseudo-Middle Ages. There are some legitimately profitable endeavors taking place, but those endeavors are also necessary to extend control to as much of the market as possible. And in the process, he moved his own men into place. The Keepers of the Keys were his, all four. The King’s Counter and the King’s Scales were men he’d named. The officers in charge of all three mints. Harbormasters, tax farmers, customs sergeants, wool factors, toll collectors, pursers, wine factors; nine of every ten belonged to Littlefinger. They were men of middling birth, by and large; merchants’ sons, lesser lordlings, sometimes even foreigners, but judging from their results, far more able than their highborn predecessors. We can assume that these men share the salary arrangements we saw with Slynt. They each likely pay a percentage of their wages to their superiors, with some of that money reaching Littlefinger. Since these men are directly involved in financial transactions, they probably more than make up for what they lose in salary from bribes and a cut of Littlefinger’s corrupt endeavors that they’re enforcing or enabling. Also, even with the salary tribute, these positions are probably better than they could have hoped for given their lower birth stations. Petyr Baelish has basically set up his own financial feudal system amongst the sheep right under the shepherd’s nose. “Who cares how much pickled cod they ate six hundred years ago?” Jon wondered. “I would.” Sam carefully replaced the scroll in the bin from which Jon had plucked it. “You can learn so much from ledgers like that, truly you can. I know some of these names. These are rich men. Traders, merchants, craftsmen. I wouldn’t have been so quick to let Joffrey fling the Antler Men over the walls if I’d known how many of the bloody bastards had taken loans from the crown. These loans were, at least in part, the capital provided to Littlefinger’s merchants to buy up a sufficient quantity of the supply to influence and then exploit the market price. So, when we reach the TWOW gift chapter and see Littlefinger’s plan to hoard grain and sell at desperation prices, this isn’t anything new for him at all. He’s simply continuing a practice he’s been engaged in for over a decade, because he believes that practice to be responsible for his “success.” Of course, like the rest of his actions as Lord Protector, the difference is that he’ll be doing it in the open and will have to bear the consequences of being the public decision-maker that were never a factor while he operated from the shadows. The Antler Men also provide another example of Petyr’s failure to keep his hands clean. It seems rather unlikely that rich men being showed favor by the current Master of Coin would plot against the crown. Other merchants competing with those being shown favor might have cause to seek a regime change, but not those with preferential treatment under the current rulers. Tyrion’s initial bewildered reaction to the news seems closer to the truth. While there may well have been a plot by some to open the gates for Stannis, it would seem that Varys added the names of Littlefinger’s merchants to the list. So Varys is covering Littlefinger’s trail while also diminishing his assets and influence, but intentionally leaving Littlefinger in play by preventing Tyrion from pursuing the trail evidence in the future. Despite the earlier setback of Ned’s beheading, Varys still acts as if Littlefinger were his pawn and not a competing player. Littlefinger turned away. “Boy, are you fond of potted hare?” he asked Podrick Payne. “Invest in pots,” Littlefinger advised. “Hares will soon overrun the castle. We’ll be eating hare thrice a day. This quip is rather revealing for Littlefinger’s underlying thought process. He isn’t simply thinking of a starving city and seeing a waste of potential food in Joffrey’s bad aim. He’s thinking past the food to ancillary goods people will need to cook it and how he can profit from that need as he’s been doing for his whole tenure as Master of Coin. He’s been invited to a meeting with the Hand of the King, the same Hand that has recently made a chess move to deprive him of an asset in the Gold Cloaks. Littlefinger’s thoughts would be focused on the game and his seemingly offhand remark is telling. He’s looking to Joffrey, the king, and how to profit from his folly. His confident air and bold taunting of Tyrion with the infamous dagger show his faith in his own ability to play Joffrey as a trump card against Tyrion as he had previously played Robert against Stannis over the Slynt incident. Petyr’s beliefs that sibling rivalry can be exploited to overcome the loyalty bonds of family are on full display, as are his views that the power he wields through vice and money is greater than being a highborn son of a great lord even when wielding a lofty title like Hand of the King. But do I dare touch him? Tyrion wondered. Even if he is a traitor? He was not at all certain he could, least of all now, while the war raged. Littlefinger was no threat to anyone. A clever, smiling, genial man, everyone’s friend, always able to find whatever gold the king or his Hand required, and yet of such undistinguished birth, one step up from a hedge knight, he was not a man to fear. He had no banners to call, no army of retainers, no great stronghold, no holdings to speak of, no prospects of a great marriage. With the exception of acquiring an army in fact instead of in name only, Petyr Baelish will put himself on other people’s radar for all of the reasons Tyrion lists here. He’ll have a powerful marriage to Lysa, holdings and strongholds in Harrenhal and the Eyrie as Lord Protector, and at least in theory the banners of the Vale and Riverlands to call. Gold reasons,” Littlefinger suggested at once. Petyr Baelish makes no distinctions between gold and “gifts.” Nobles may react poorly when offered gold like a tradesman, but to Littlefinger despite the veneer they’re being bought and sold all the same. We also see his focus on markets where he hints that chickens may well be more valuable than lords. While the foundation for the Purple Wedding is laid here, Petyr deservedly comes across as a very astute player, but within his mockery of the lords he’ll play so well are also the seeds of his likely undoing. Petyr’s ability to make Robert’s men his helps to reinforce his disdain for the Family, Duty, Honor pillars of Westerosi loyalty, but he’s failing to account for his formative lesson in keeping up appearances. These men are Petyr’s in fact so long as they can remain Robert’s or Joffrey’s in name. Overtly commanding loyalty as the man in charge is a very different dynamic from covertly corrupting loyalties from the shadows. The limits of what gold can buy is a hard lesson Tyrion learns repeatedly throughout his entire arc, and thematically gold’s position as one of the three pillars of power in the Varys riddle makes it a dubious basket to store all of one’s golden eggs. Unlike Tyrion, Petyr has shown no evolution in his understanding of the limits of gold even after he has emerged from the shadows into the spotlight as Lord Protector of the Vale. The “evil genius” of the mockingbird seems destined for the same fate as the “super genius” of the coyote—a great fall. That fall will almost certainly involve some manner of reaping the harvest Littlefinger has sown, but the specifics remain elusive. From the analysis of the dynamic of his past plotting, we can begin to speculate on what his current schemes and agenda for the future might be. To date, the one unchanging facet of Littlefinger’s plotting and chameleon loyalties is his fixation with Sansa. It is Sansa who is the key to piecing together Petyr Baelish’s agenda, and Sansa who offers us the best clues and insights into the impending demise of the mockingbird.